Do you have a child that has had diaper rash or irritation? Chances are the answer is yes. I know that Dexter has occasion irritation, especially overnight. Terry Cloth. They are very convenient, being only 5x7 they fit in your diaper bag or anywhere else you may need them. They come in a wide-variety of cool colors, I chose the Boy pack of 10 blue and green wipes. They are also machine washable and they will not fade or pill! How nice! How they work. After diaper changes, I would wipe Dexter with a Bummas wipe to ensure that his bum was nice and dry. Thats the trick! That is why I didn't need to use baby powder or creams! How would you like the chance to win a 10-pack of Bummas, valued at $16?! 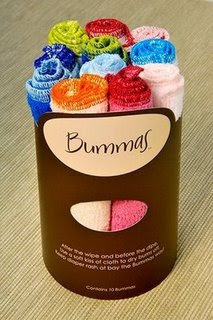 THANK YOU to our friends over at Bummas you will get a chance to do just that. All you have to do is head over to Bummas and come back here and comment with your favorite color combination. Good Luck! You have until NOON on January 28th to enter to win. You're now blogged by ME!! I love the Caaaalm Ones! I like the Wild Ones. Thanks. i like the he Wild Ones the best. thanks!! I like the calm ones the most. Love those colors! my fave is "the boys"! These sound soft and lovely! I like the Girls or the Wild Ones! Thanks for entering me! Love the wild ones and the calm ones. I would choose the Calm ones. I love the natural colors. Thanks! I like the wild ones. #2 I put your button on my blog.